Candida, very simply, is a mold, or fungus, which inhabits the body. There are, in fact, about 20 different types of Candida fungi living in our bodies and in the environment around us, with some residing in our gastrointestinal tract. Candida albicans is a yeast the normally resides in the body in the digestive tract, kept in check by the immune system and beneficial bacteria in the body. Excess Candida yeast in the intestines is thought to penetrate the intestinal wall, causing yeast and other unwanted particles to be absorbed into the body. When the Candida mold has grown out of control and begun to create harmful effects within the body, it creates an infection known as candidiasis. Candidiasis can affect many parts of the body, causing localized infections or larger illness, depending on the person and his or her general health. The Candida mold in your colon and intestinal tract feeds off the food that you eat, especially sugars and starches. This takes away from the nutrients which you need to survive. The mold then begins to produce it's own waste products. These wastes are toxic to the system and cause much of the sickness and disease which plagues man. Some Candida is a yeast organism that is found in everyone's body naturally. In small amounts, Candida is actually helpful to the system. This is because it acts as a natural antibiotic. It helps control the growth of bacteria. It is kept in check by beneficial bacteria, forming a balance in the intestines. Through the use of antibiotics, or swimming, bathing in or drinking chlorinated water, the essential beneficial bacteria in the gut are killed off. In medicine, molds similar to yeast are used as antibiotics to kill off bacteria. But these antibiotics also kill the same beneficial bacteria that help keep Candida in check in the normal system. Then the balance is destroyed and Candida thrives and can take over. Another way Candida thrives is by feeding it with excessive sugar, which enables it grow out of balance, especially when the beneficial intestinal bacteria have been weakened by chlorine. If your answer is yes to any question, add up the points to the right of the question. Your score will help you determine the possibility (or probability) that your health problems are yeast connected. If your score is 9 or more, your health problems are probably yeast connected. If your score is 12 or more, your health problems are almost certainly yeast connected. 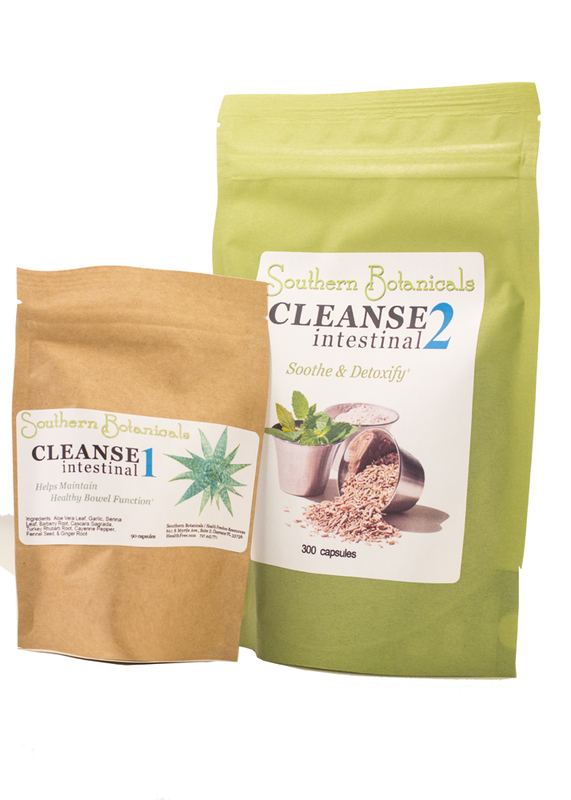 The first step is cleansing by doing an herbal and dietary intestinal cleanse program. The result will be flushing the colon of the long-term waste and some of the Candida organisms which have built up and making a cleaner environment that does not continue to feed the yeast (Candida). Be prepared for some discomfort as the yeast dies off. Continue cleansing despite this for best results. For more information on cleansing read Your Guide to Cleansing. Candida and parasites often inhabit your body together. The conditions that make your intestinal tract and organs vulnerable to one of these and its presence, also makes conditions more favorable to other as well - espeially a weakened immune system and disturbed microflora. Thankfully, some of the same things that destroy parasites, also destroy Candida. Our Candida and Parasite Super 4-Pack can be added to your Intestinal cleansing regimen or taken aside from cleansing to boost your ability to fight off both Candida and parasites. 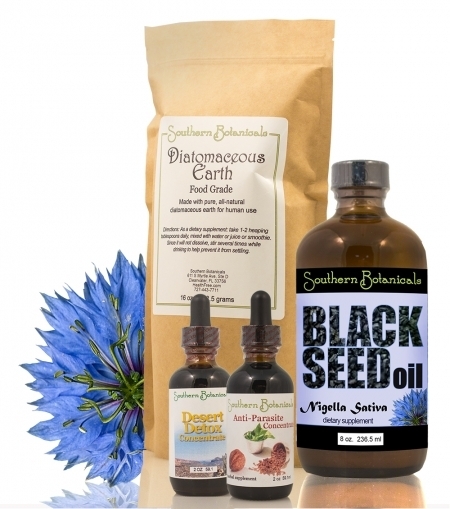 This Super 4-Pack includes super-destroyers Black Seed oil, Diatomaceous Earth, Desert Detox, and the Anti-Parasite Concentrate. Black seed oil has many uses and benefits, including its anti-fungal properties (think fungus = Candida). One of the many benefits is that it’s a parasite cleanser and slightly laxative. 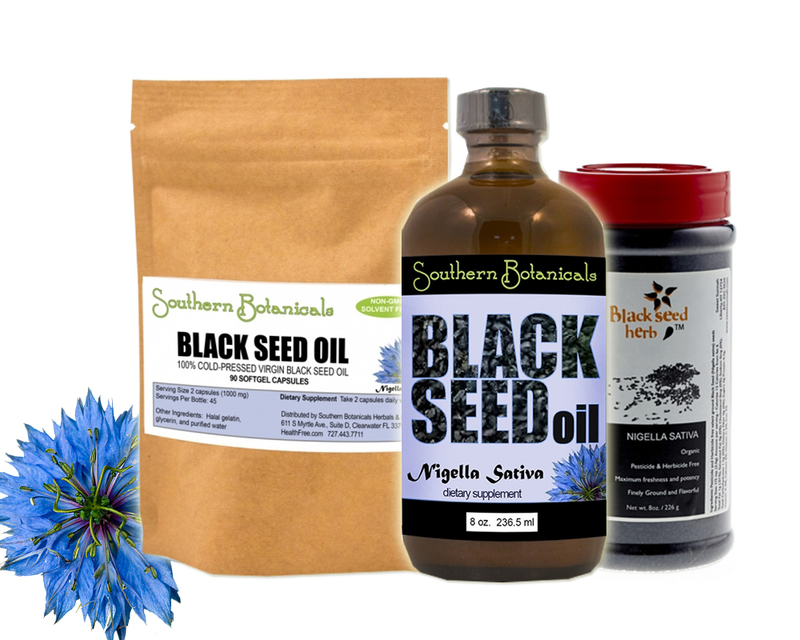 Black Seed Oil discourages parasites from attaching to the intestinal wall & helps to expel them. It can be used as an oil, in capsules, or as the whole seed for cooking. The seed and oil are super-nutritious too, with minerals and a natural concentration of essential linoleic and linolenic fatty acids which cannot be synthesized by our bodies and are necessary for optimal health. Black Seeds help to promote a healthy immune response, and also support digestive and respiratory health. While you are cleansing, stop eating the things that yeast needs and craves: sugar, dairy, high-carbs. 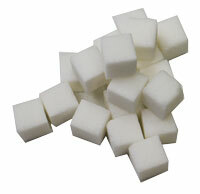 Ruthlessly cut out sugars, even most fruit for now. Reduce whole grains, and eliminate processed grain products of all kinds. Eat what it does not use well: vegetables, clean protein and healthy, unrefined fats. Using unrefined coconut oil is an excellent choice which helps your body destroy Candida. 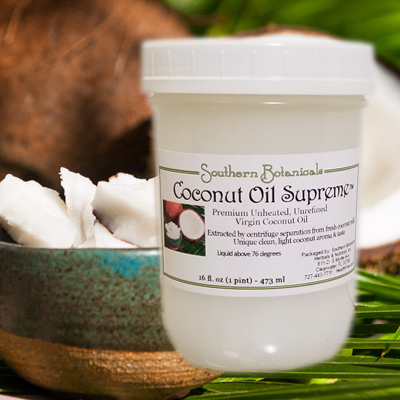 See our unheated, unrefined pure Coconut Oil Supreme. Drink water and herbal teas (unsweetened), and vegetable juices, but not fruit juice because fruits provide too much sugar to the yeast. You will find that after getting rid of Candida, your cravings for more sugary things will stop or reduce. Eventually, you can add back in more whole fruit, but hold down the grains and dairy to a small amount. Your best health will be achieved if you don't add refined sugar or any processed foods back into your diet. The next step is to replace the beneficial bacteria with probiotics. This can include probiotic supplements and then fermented foods like sauerkraut, kimchee, fermented fish sauces, unsugared yogurt (sugar just feeds the yeast again). You will start feeling better because these intestinal bacteria actually produce B vitamins in your gut, help you break down foods, activate your immune system, and heal your gut lining. 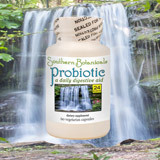 Check out our favorite probiotics here. When re-establishing the good bacteria of the body, it is extremely important to get all of the chlorine out your entire water supply. All it takes is one cup of chlorinated water to wipe out the good bacteria you are replacing. Take caution about the ice you put in your drinks as well, most contain chlorine. Be cautious also about tea and coffee made at restaurants because they are made with tap water, too. Also, some bottles waters contain natural or remaining chlorine. Many are just purified municipal water! So do your homework and choose your bottled water wisely. Water filters may have silver and copper impregnated in them to kill off bacteria. 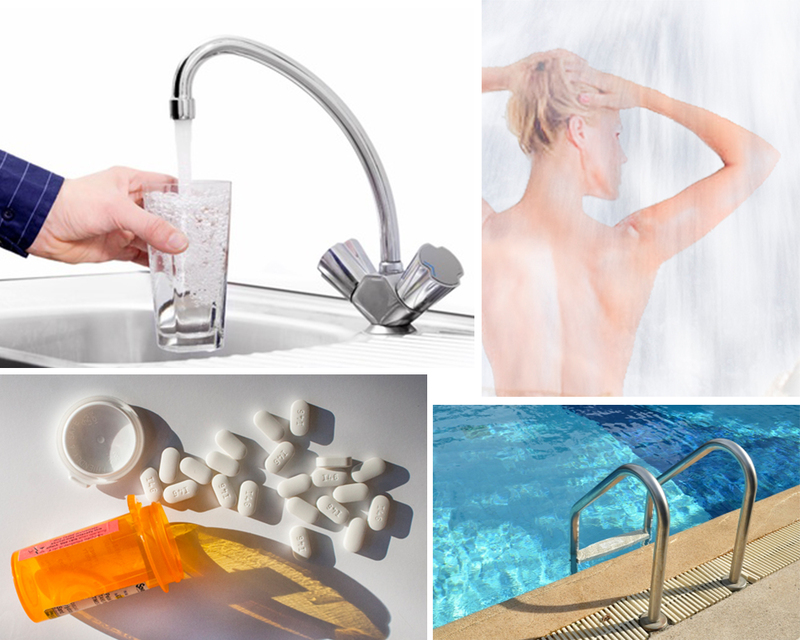 These substances work like an antibiotic or chlorine so make sure your water filter removes all the chlorine and does not add anything antibacterial to the water. Also, go through your toiletries and throw away any product that is antibacterial, including liquid hand soaps, insectide soaps, douches, deodorants, etc. Triclosan, the common antibacterial ingredient has been banned in some products, but not all. The more you can protect your body from toxic chemicals and refined processed foods, the stronger your body can be to get rid of and resist Candida in the future. Periodic cleansing can help you achieve and maintain food health. See all our Cleanse, Herbal, Nutritional and Non-Toxic, Personal Care products.